Modern art materials introduced since the end of XIX century include a large number of formulations of synthetic polymers and pigments, whose degradation processes and best preservation conditions are a major issue in heritage science. Analytical pyrolysis coupled with gas chromatography and mass spectrometry (Py-GC/MS) is widely used for the characterisation of polymeric materials and organic pigments, however the interpretation of the pyrograms obtained from samples containing different analytes is not straightforward. To improve our understanding on how these materials behave in complex matrices, we used evolved gas analysis coupled with mass spectrometry (EGA-MS) and multi shot Py-GC/MS to highlight and analyse the different fractions in a sample from a pop-art made of painted polyurethane (PU) foam. The study represents a proof of concept to evaluate EGA-MS potential in studying composite modern art materials in combination with multi-shot pyrolysis. The aim of the investigation was establishing the composition of the PU formulation, the paint binder and the pigments, thereby contributing to planning the stabilisation and conservation of the object. The polymers and the class of synthetic organic pigments present in the paint were assessed by determining their specific pyrolysis products and through comparisons with data in the literature. EGA-MS analysis provided both thermal and chemical information in one analytical run, so that we could select four temperatures for use in multi-shot Py-GC/MS analysis and thus to selectively study the different fractions evolved at different temperatures. Information on the various components of the mixture was obtained, including additives and organic pigments, separating them on the basis of their different thermal degradation temperatures. The multianalytical approach included also non-destructive ATR-FTIR and enabled us to characterize in detail different synthetic materials: polyether-based polyurethane produced by the polyaddition of 2,6-diisocyanate toluene, hexamethylene diisocyanate and polypropylene glycol, vinyl paint, and a mixture of β-naphthol and mono-azo as pigments. HPLC–DAD and HPLC–ESI–MS analyses confirmed the pigments, and provided a positive identification of two β-naphthols (PO5 and PR1) and two monoazo pigments (PY1 and PY3). Preserving modern and contemporary artworks and design objects is emerging as a major issue in conservation science, due to the wide range of new techniques and materials for artists that have been introduced since the end of the nineteenth century [1, 2]. Modern art materials include a large number of formulations of synthetic polymers and pigments whose degradation processes and optimal preservation conditions are far from being fully assessed. In addition, the combination of more than one material in the same artwork makes the conservation of synthetic polymers in heritage objects a critical issue, due to possible interactions between components, which are characterized by different degradation pathways and a different durability. In particular, some classes of synthetic organic pigments (SOPs) are labile and vulnerable to fading and photo-oxidation phenomena . The knowledge of their exact composition, in terms of both major and minor components, is mandatory to disclose the chemical behaviour of a specific SOP over time . Correctly identifying modern artistic materials also represents a challenge for chemical analysis, especially for composite objects. The identification of organic pigments is further complicated by the lack of information generated by their generic trade names and by the frequent commercialization of the same compound under different names and vice versa; moreover, scarce attention was often paid to the purification steps . FTIR spectroscopy is one of the most common approaches used to identify synthetic polymers in heritage objects [6–11]. However, its effectiveness is dramatically reduced when studying samples constituted by a mixture of materials. Pyrolysis coupled with gas chromatography and mass spectroscopy (Py-GC/MS) has proven fundamental in the chemical analysis of synthetic polymers [12–23] and SOPs [16, 24]. Unfortunately, the identification of dyes and pigments is based on the detection of specific pyrolysis products, which are often insufficient to assess the exact molecular formula of the pigment under study. Moreover, due to patent wars, several synthetic strategies were proposed for the production of analogue dyes or pigments  and the presence of synthesis by-products, which might provide insights on the provenance of the colouring material, can hardly be assessed by Py-GC/MS. A more in-depth characterisation can only be obtained by using liquid chromatography with high resolution mass spectrometry (HPLC–MS), which is able to identify the intact coloured molecules present both as major and minor components of the pigment [26, 27]. In the last 10 years multi-shot pyrolysis-gas chromatography/mass spectrometry (Py-GC/MS) has been applied to maximize the information obtained from the analysis of single samples containing different components with a wide range of molecular weights [12, 28]. In heritage science, Py-GC/MS has been used for identifying and discriminating between the additives used in the production of synthetic paints and for investigating degradation processes [20, 21, 29]. The information obtained by a combination of thermal and chemical analyses can be further improved by using evolved gas analysis-mass spectrometry (EGA-MS). Integrating multi-shot Py-GC/MS with EGA-MS data significantly increases the selectivity of the chemical information of pyrolysis-based approaches. Evolved gas analysis can be applied to characterise the thermal profile of a sample, and the data obtained can be used to optimize the temperatures used in multi shots Py-GC/MS analysis . To date, EGA-MS has been mainly used to study reference materials in order to rationalize degradation pathways, or to disclose the nature of interactions occurring in composite materials, however it also provides insights into the nature and degradation of unknown samples [29–31]. 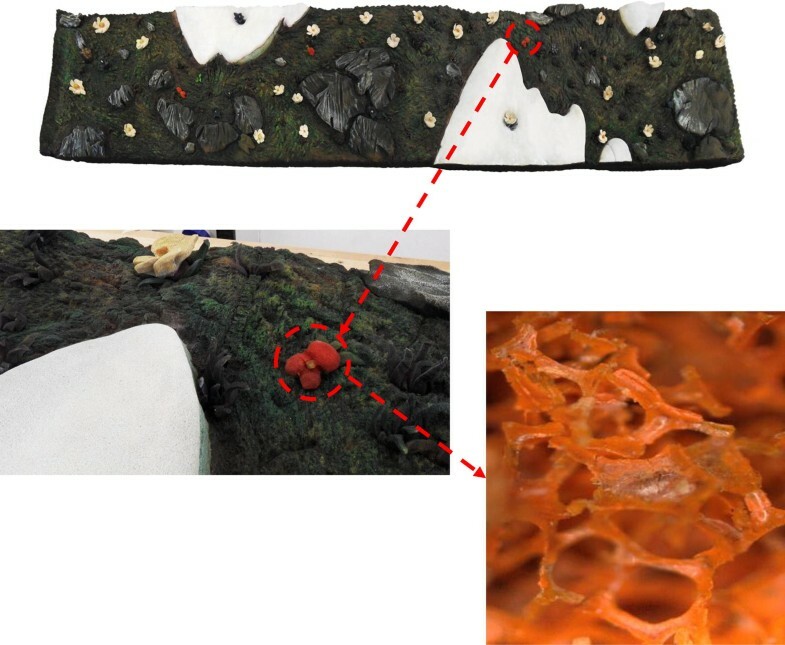 This study further explores the advantages of introducing EGA-MS in the field of heritage science and examine its potential in combination with multi-shot pyrolysis to investigate modern artistic materials. As a proof of concept to evaluate the approach, here we present the results obtained in the investigation of a sample from painted polyurethane (PU) foam. The sample was collected from the pop-art sculpture “Disgelo” (1968, painted polyurethane foam, 440 cm × 99 cm), by the Italian artist Piero Gilardi (1942). The artwork belongs to the series of “Tappeti Natura” (Nature Carpets), which are detailed and realistic copies of patches of natural landscapes made in polyurethane flexible foam, colourfully painted with great detail to achieve a hyperrealistic and synthetic reproduction of nature (Fig. 1) [32, 33]. The preservation and stabilisation of PU artworks in the conservation of modern art from the 1960s is extremely challenging . The aim of the investigation was establishing the composition of the PU formulation, the paint binder and the pigments, and thereby contributing to planning the stabilisation and conservation of the object for future accessibility. EGA-MS was applied to evaluate the thermal profile of the sample and to optimize the pyrolysis temperatures for the subsequent application of multi shot Py-GC/MS in order to separately analyse the different components of the sample. Finally, high-performance liquid chromatography with diode-array and mass spectrometric detection (HPLC–DAD and HPLC–DAD–ESI–MS) and infrared spectroscopy analyses were performed to integrate the results obtained by pyrolysis-based methods . The evaluation of the adopted micro-destructive analytical approach was particularly interesting in this case where non-destructive spectroscopic techniques commonly used to investigate heritage objects (such as portable non-invasive FTIR and Raman spectroscopy) were not applicable, due to the highly porous nature of the polyurethane foam, the complex mixture of components, and the presence of a surface paint layer. The sample, DG1, characterized by a bright red colour, was collected by the restorer Antonio Rava during some conservation of the artwork, planned prior to the exhibition “Nature Forever. Piero Gilardi” (April to October 2017) at the Maxxi Museum in Rome . The weight of the sample was 1.5 g.
ATR-FTIR spectra were collected directly on fragments of foam using a Perkin Elmer Spectrum 100 spectrometer coupled with a MIRacle TM ATR accessory equipped with a SeZn crystal. Sixteen scans were collected from 4000 to 650 cm−1 with a resolution of 4 cm−1. The analyses were performed at room temperature (22 °C). Jasco Spectra Manager software was used for data analysis. The samples were placed into a pyrolysis stainless-steel cup, weighed (500 µg), and inserted into the microfurnace. The instrumentation consisted of a micro-furnace Multi-Shot Pyrolyzer EGA/Py-3030D (Frontier Lab, Japan) connected to an Agilent 5973 single quadrupole Mass Selective Detector through an Ultra ALLOY ® EGA Tube (2.5 m × 0.15 mm i.d). The EGA-tube was thermostated at 300 °C inside the oven of a 6890 N gas chromatographic system (Agilent Technologies). The temperature program for the micro-furnace chamber of the pyrolyzer was as follows: initial temperature 50 °C; 10 °C/min up to 800 °C for 10 min. Analyses were performed under a helium gas (purity 99.9995%) flow (1 ml/min) with a split ratio 1:20. The micro-furnace interface temperature was automatically kept at 100 °C higher than the furnace temperature up to a maximum value of 300 °C. The inlet temperature was 280 °C. The mass spectrometer was operated in EI positive mode (70 eV, scanning m/z 50–700). The MS transfer line temperature was 300 °C. The MS ion source temperature was kept at 230 °C, and the MS quadrupole temperature at 150 °C. Analyses were performed using the same multi-shot pyrolyzer EGA/PY-3030D (Frontier Lab) mentioned in “Evolved gas analysis-mass spectrometry” section, coupled with the 6890 N gas chromatographic system with a split/splitless injection port, and with the above mentioned 5973 mass selective single quadrupole mass spectrometer (both Agilent Technologies) . Multi-shot pyrolysis conditions were optimized as follows. Pyrolysis temperatures were selected based on the specific EGA/MS results (“Py-GC/MS” section): shot 1: 260 °C; shot 2: 308 °C; shot 3: 340 °C; shot 4: 600 °C. The interface and the GC injector were kept at 280 °C. The GC injection was operated in split mode, with a split ratio of 1:10. The chromatographic separation of pyrolysis products was performed on a fused silica capillary column HP-5MS (5% diphenyl-95% dimethyl-polysiloxane, 30 m × 0.25 mm i.d., 0.25 μm film thickness, J&W Scientific, Agilent Technologies), preceded by 2 m of deactivated fused silica pre-column with an internal diameter of 0.32 mm. The chromatographic conditions were: 40 °C for 5 min, 10 °C/min to 310 °C for 20 min. The helium (purity 99.9995%) gas flow was set in constant flow mode at 1.2 ml/min [13, 14, 17–19, 37]. MS parameters: electron impact ionization (EI, 70 eV) in positive mode; ion source temperature 230 °C; scan range 50–700 m/z; interface temperature 280 °C. Perfluorotributylamine (PFTBA) was used for mass spectrometer tuning. MSD ChemStation (Agilent Technologies) software was used for data analysis and the peak assignment was based on a comparison with libraries of mass spectra (NIST 1.7, WILEY275) and the literature data . Prior to each analysis sequence, the pyrolysis cup was cleaned and a blank was run by inserting in the pyrolysis cup 2 μl of hexamethyldisilazane (HMDS, Sigma-Aldrich, USA) as derivatizing agent. HPLC was performed to investigate the organic pigments contained in the sample. The method is a slight adaptation of a previously published method used to study reference synthetic organic dyes and pigments . The sample pre-treatment prior to both chromatographic analyses consisted in the addition of 500 μl of dimethyl sulfoxide to approximately 850 µg of sample, followed by sonication (ultrasonic bath Sonorex Supra 10P, Bandelin Electronics, Germany) for 10 min at 60 °C. The supernatant was filtered with a PTFE syringe filter, and directly injected into the chromatographic system. The injection volume was 10 μL. The HPLC system consists of a PU-2089 quaternary pump equipped with a degasser, an AS-950 autosampler, and an MD-2010 spectrophotometric diode array detector (all modules are Jasco International Co., Japan). The diode array detector (DAD) operated with spectra acquisition in the range of 200–650 nm every 0.8 s with 4 nm resolution. ChromNav software was used to carry out data acquisition and data analysis. An HPLC 1200 Infinity was used, coupled with a quadrupole-time of flight mass spectrometer Infinity Q-ToF 6530 detector by a Jet Stream ESI interface (Agilent Technologies, USA). ESI conditions were: drying and sheath gas N2, purity > 98%, temperature 350 °C, flow 10 l/min and temperature 375 °C, flow 11 l/min, respectively; capillary voltage 4.5 kV; nebulizer gas pressure 35 psi. The high resolution MS and MS/MS acquisition range was set from 100 to 1000 m/z in negative mode, with acquisition rate 1.04 spectra/s. For the MS/MS experiments, 30 V were applied in the collision cell to obtain CID fragmentation (collision gas N2, purity 99.999%). The FWHM (full width half maximum) of quadrupole mass bandpass used during MS/MS precursor isolation was 4 m/z. The Agilent tuning mix HP0321 was used daily to calibrate the mass axis. MassHunter Workstation Software (B.04.00) was used for both data acquisition and data analysis. The eluents for the HPLC–DAD analyses were: water and acetonitrile (ACN) both HPLC grade (Sigma Aldrich, USA), while the eluents for HPLC-ESI-Q-ToF analyses were water and acetonitrile, both LC–MS grade (Sigma-Aldrich, USA). All eluents were added with 0.1% v/v formic acid (FA; 98% purity, J.T. Baker, USA). The chromatographic separation was performed on an analytical reversed-phase column Poroshell 120 EC-C18 (3.0 × 75 mm, particle size 2.7 μm) with a Zorbax SB-C18 pre-column (4.6 × 12.5 mm, particle size 5 μm), both Agilent Technologies. The flow rate was 0.4 ml/min and the program was 15% B for 2.6 min, then to 50% B in 13.0 min, to 70% B in 5.2 min, to 100% B in 0.5 min and then held for 6.7 min. Re-equilibration took 11 min. During the separation, the column was kept at 30 °C. Figure 2 shows the ATR-FTIR spectrum of the sample. Table 1 reports the identification of the observed ATR-FTIR bands [20, 39–43]. The spectrum shows the presence of a polyether-based polyurethane on the basis of the stretching vibration of C–O–C at 1093 cm−1. Absorption bands typical of hydrogen bond interactions were observed: N–H stretching at 3661–3303 cm−1 (H-bonded and non H-bonded) and in the carbonyl region (1740–1640 cm−1), with a stretching vibration corresponding to that of the H-bonded urea at ~ 1641 cm¯1. The formation of free urea is a sign of the cleavage of urethane bonds [40, 44], suggesting an ongoing depolymerisation process in the material. Two intense absorption bands were observed at 1731 cm−1 and at 1226 cm−1, which may be related to the stretching vibration of the ester carbonyl group (C=O) and the stretching vibration of ester C–O–C=O group, respectively. This suggests that a polyester was present in the paint formulation. Other significant absorption bands were: the –C–H2 and –C–H3 stretching (2970-2950 cm−1), the amide II band at 1537 cm−1, and the region between 970 and 600 cm−1 which corresponds to C-H benzene ring bending and –C–H2 skeletal deformation. In addition to the bands derived from the PU foam, an N=N-stretching band was observed at 1504 cm−1 , which is characteristic of the structure of mono-azo and β-naphthol pigments . 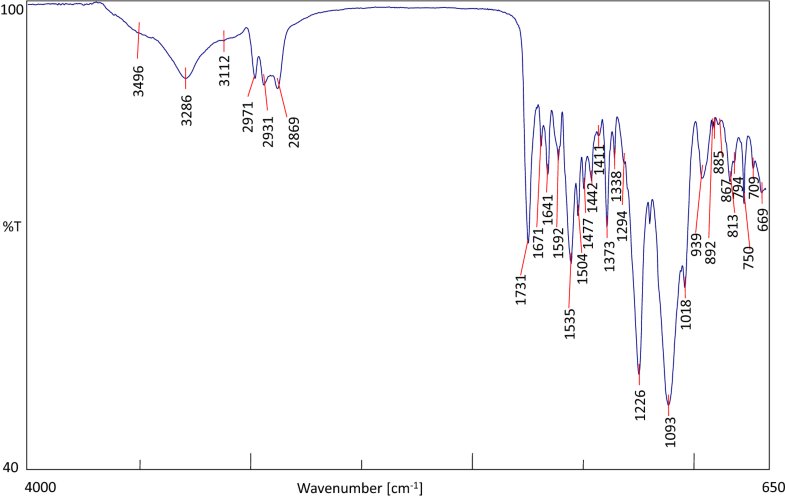 Figure 3 shows the EGA-MS profile obtained for the sample from “Disgelo” together with the average mass spectra obtained for the four thermal degradation peaks identified. The thermogram shows four main thermal degradation zones: zone 1 corresponds to the temperature range 200–290 °C, zone 2: 290–320 °C, zone 3: 320–360 °C, and zone 4: 360–530 °C. On the basis of the mass spectra, the first thermal degradation step (zone 1) corresponds to the desorption of additives, plasticizers and to the first depolymerisation step of the polyurethane linkage, forming diisocyanates species (250–300 °C) . The most abundant ions in the mass spectra of this EGA peak are fragments with m/z 174, 148, 145 which correspond to 2,6-toluene diisocyanate, and fragments with m/z 149, 121, 132, 93 which correspond to phthalates . The second and the third thermal degradation steps (zones 2 and 3) may be related to the pyrolysis of the polymeric network . The most abundant ions in the corresponding mass spectra are fragments with m/z 99, 82, 67, 55, related to cyclohexene and hexenol structures, such as chain extenders in the PU network and rearrangement pyrolysis products. The spectrum corresponding to the last thermal degradation step (zone 4) is more complex, and can be related to the complete thermal degradation of the polymeric network (m/z 117, 101, 87, 73, 59). On the basis of the EGA profile, we selected four temperatures to perform multi-shot Py-GC/MS analysis: 260, 308, 340 and 600 °C, respectively. 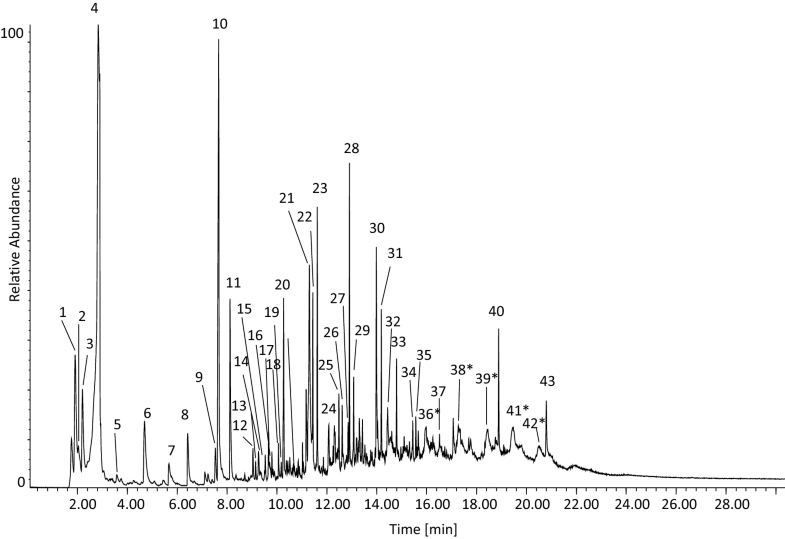 Figure 4 shows the Py-GC/MS chromatogram obtained for the first pyrolysis shot at 260 °C. The peak assignments are listed in Table 2. The most abundant species desorbed at 260 °C are diethyl phthalate (peak 8), diisobutyl phthalate (peak 11), and dibutyl phthalate (peak 14, main peak in the chromatogram). These species are commonly used as plasticizers in the production of plastic formulations. The analysis enabled us to identify the presence of 2,6-diisocyanate toluene (peak 1) [38, 49, 50], one of the precursors used in the synthesis of the polyurethane foam, and its rearrangement derivatives 2-amino-6-isocyanato toluene (peak 2). In addition, the pyrolytic profile obtained for the first thermal zone features the presence of 2-naphthol (peak 5), possibly related to β-naphthol pigments [16, 51]. Figure 5 shows the Py-GC/MS chromatograms obtained for thermal zones 2 and 3, obtained at 308 °C and 340 °C, respectively. The two chromatographic profiles have many peaks in common, but with different relative abundances. The species identified are listed in Table 3. The most abundant species in the pyrogram obtained at 308 °C (second shot, Fig. 5a) are 2,6-diisocyanatotoluene (peak 3), 2-amino-6-isocyanato toluene (peak 5), and hexamethylene diisocyanate (HDI -1,6-diisocyanatohexane—peak 4). Hexamethylene diisocyanate can be identified as a second diisocyanate precursor besides the already mentioned 2,6-diisocyanate toluene, thus highlighting the complexity of the formulation. A series of different chain length ether oligomers (m/z 175, 117, 103, 87, 73, 59) are also present, derived from the thermal degradation of the polyether component. Interpretation of the pyrolytic profile corresponding to the second shot enabled us to identify the PU as a polyether-based polyurethane produced by the polyaddition of 2,6-diisocyanate toluene, hexamethylene diisocyanate and polypropylene glycol. The result obtained by pyrolysis-GC/MS confirms that the second thermal zone is mainly related to the thermal degradation of the polymeric network. The main peaks of the pyrogram obtained at 340 °C (third shot, Fig. 5b) are due to the thermal degradation products of the organic pigments used to colour the foam. 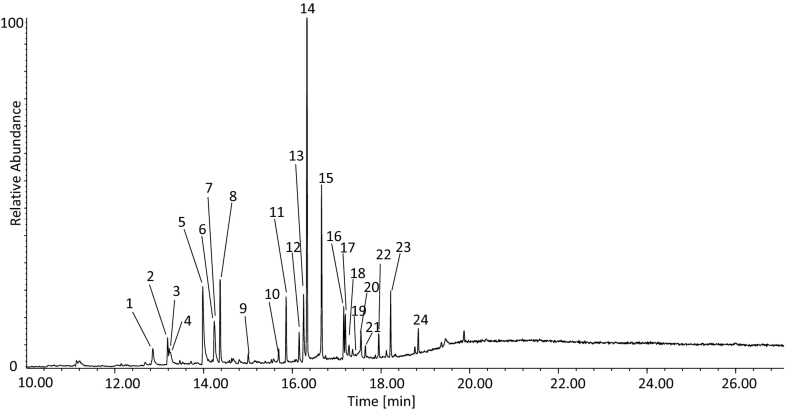 The most abundant peak in the chromatogram corresponds to 2,4-dinitroaniline (peak 17), and the other significant pyrolysis products attributable to organic pigments are the above mentioned 2-naphthol (peak 8), 2-chloroaniline (peak 1), 2-chlorophenyl isocyanate (peak 2), and 4-chloro-2-nitroaniline (peak 12) . These markers are typical of a mixture of β-naphthol and mono-azo pigments . At higher temperatures, ether oligomers (peaks 21 21, m/z 175, 117, 103, 87, 73, 59) are still produced, as proved by their identification in the pyrogram related to the third shot. Several other minor compounds related to the partial pyrolysis of the PU polymeric network were also detected. Finally, Fig. 6 shows the pyrogram obtained by performing the last pyrolysis step at 600 °C (fourth shot), and the thermal degradation products identified are listed in Table 4. The pyrolysis profiles show molecules indicative of a polyvinyl acetate polymer: benzene (peak 4), styrene (peak 11), indene (peak 20), 1,2-dihydronaphthalene (peak 22), naphthalene (peak 23), 2-methylnaphthalene (peak 25), 1-methylnaphthalene (peak 26), and biphenyl (peak 29) . The results enabled us to identify that the artist used a vinyl-based paint. Oligomers of the polyether-based polyol used in the synthesis of the PU foam, chain extenders such as 5-hexen-1-ol, and cyclohexene and diisocyanate precursors were also abundant in the pyrogram . 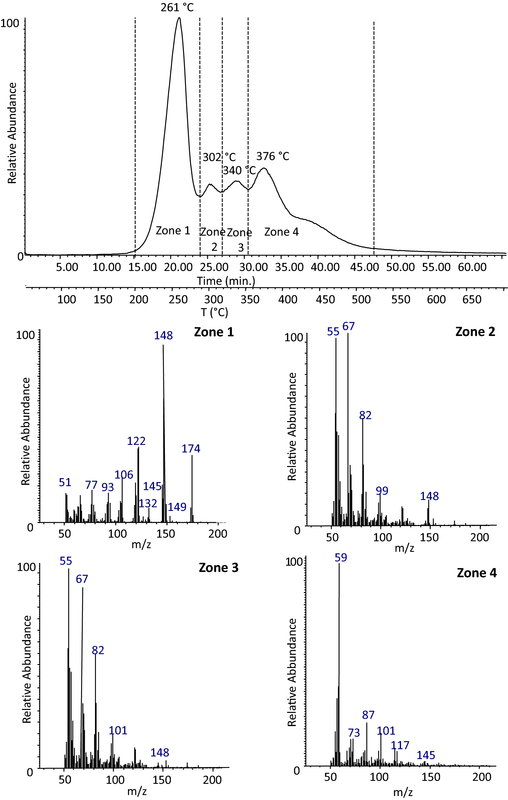 As for the third and fourth shots, we identified a series of ether oligomer peaks derived from the complete thermal degradation of the polymeric network (m/z 117, 101, 87, 73, 59, chromatographic peaks 36, 38, 39, 41, 42). HPLC–DAD analysis was carried out not only for confirming the hypothesis about the chemical class of the SOPs suggested by pyrolysis results, but also for unambiguously identifying the specific pigment(s) present in the paint. 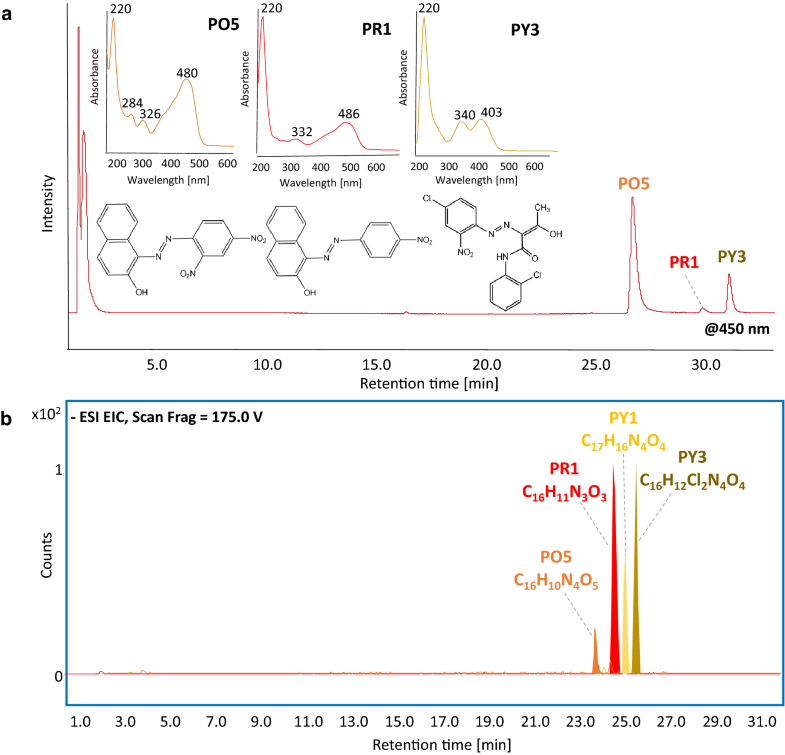 HPLC–ESI–Q-ToF selectivity and sensitivity were also exploited to detect minor coloured components. 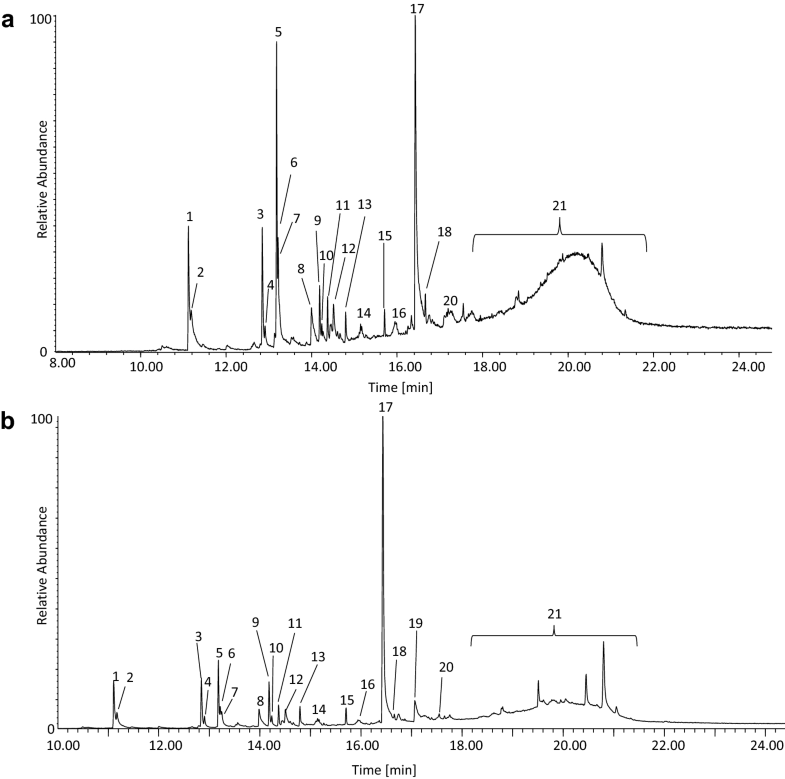 Figure 7 shows the HPLC–DAD chromatogram obtained at 450 nm from the sample extract, and the extracted ion chromatograms relating to the identified pigments. Comparison with the reference materials, UV–Vis spectra from the literature, high resolution mass spectra, and tandem mass spectra interpretation revealed the composition of the colour. The paint contained a mixture of two β-naphthols (PO5 and PR1) and two monoazo pigments (PY1 and PY3) characterized by orange, red and yellow hues, employed to paint the polyurethane foam of the flower petals. In particular, PO5, PR1 and PY3 were detected in the HPLC–DAD chromatogram (see Fig. 7). PY1 (molecular ion [M-H]− at m/z = 339.199) was detected by HPLC-ESI-Q-ToF only, due to its lower concentration with respect to the other pigments, thanks to the high selectivity and sensitivity of the mass spectrometric analyser. PR1 (C.I. 12070) and PO5 (C.I. 12075) are amongst the most significant β-naphthols, which were first put on the market in 1885 and 1909, respectively. PY1 (C.I. 11680, patented in 1909) and PY3 (C.I. 11710) belong to the very common class of Hansa Yellows. The last pyrogram obtained at 600 °C contained the molecular markers of a polyvinyl acetate resin, which was identified as the paint binder. HPLC–DAD and HPLC–ESI–MS analyses confirmed the identification of β-naphthol and mono-azo pigments, and provided a positive identification of two β-naphthols (PO5 and PR1) and two monoazo pigments (PY1 and PY3). This case study represents the first application of EGA-MS complemented by multi-shot Py-GC/MS to a painted plastic sculpture, and serves as a proof-of concept in demonstrating how the approach is unique in resolving complex mixtures of polymers, pigments and additives without any sample pretreatment. 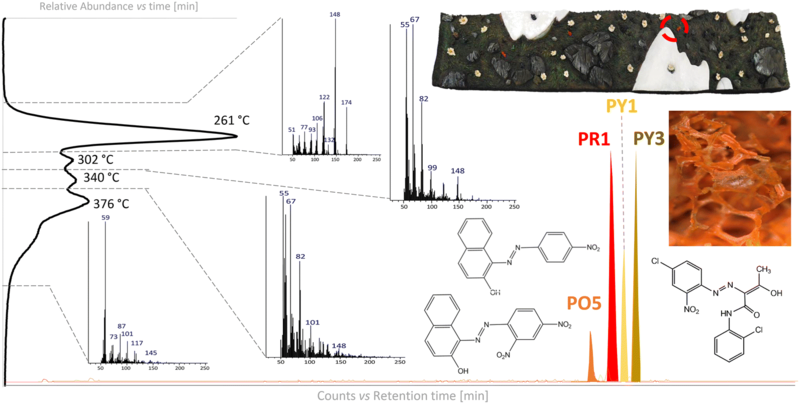 Evaluating the relative amounts of compounds produced during thermal degradation also provided semi-quantitative information, thus proving the approach extremely valuable in future studies on the degradation of materials. FM managed the research project. FM and JLN designed the experiments. JLN and GB and FS performed the analyses. JLN, GB, FS, ID and FM performed the data analysis and interpretation. JLN, FS, ID and FM wrote the manuscript. All the authors contributed to the discussion of the results and reviewed the manuscript. All authors read and approved the final manuscript. The authors would like to thank the conservator Antonio Rava. Antonella Manariti is also acknowledged for her technical assistance. This research was not supported or funded by any specific grant. University of Pisa provided the equipment, the infrastructure and the human resources, including Francesca Sabatini’s PhD scholarship.